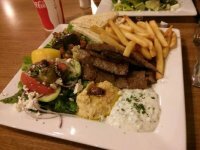 Authentic Greek & Mediterranean Foods. Specialty Food Market. Baklava & other Desserts. Indoor and outside patio seating.